The Perez Factor: Latino Senator tells President, "We don't need new taxes, we need new taxpayers"
Latino Senator tells President, "We don't need new taxes, we need new taxpayers"
Joint Senate Floor remarks push focus on country, not Washington D.C. politics. Congressional leaders are meeting today with President Barack Obama to discuss a potential $4-trillion package that could reduce the nation’s growing deficit. Topics to be discussed include: broad changes to social security; broad changes to Medicare; and an overhaul of the nation’s tax code. An interesting topic that will not be discussed is the creation of jobs, a key component Freshman Senator Marco Rubio (R-FL) believes should be a key topic. The following is a press release issued by his office and below is the video of the entire presentation. WASHINGTON, D.C. – U.S. Senator Marco Rubio (R-FL) joined Senator Kelly Ayotte (R-NH) to speak on the Senate floor about jobs and the debt. In his remarks, Rubio stressed the importance of taking bad job-destroying ideas off the table in ongoing debt reduction negotiations. 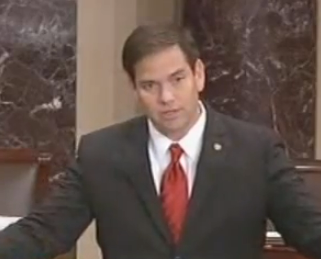 SENATOR RUBIO: “Here's the bottom line: These tax increases they're talking about. These so-called revenue enhancers, they don't solve the problem. So what do we do then? Because clearly we have to do two things. "One, we have to hold the line on spending, if you keep digging yourself in the hole, the hole is going to bury you, the other thing is how do you start generating revenue for government so you can start paying down this debt? That’s what the debate should be about. “We already know these taxes don't work. Here is what I suggest works in a balanced approach, using the President's terminology. Let's stop talking about new taxes and start talking about creating new taxpayers, which basically means jobs. “We don't need new taxes. We need new taxpayers, people that are gainfully employed, making money and paying into the tax system. Then we need a government that has the discipline to take that additional revenue and use it to pay down the debt and never grow it again. That's what we should be focused on, and that's what we're not focused on. “You look at all these taxes being proposed, and here's what I say. I say we should analyze every single one of them through the lens of job creation, issue number one in America. I want to know which one of these taxes they're proposing will create jobs. I want to know how many jobs are going to be created by the plane tax. How many jobs are going to be created by the oil company tax I heard so much about. How many jobs are created by going after the millionaires and billionaires the president talks about? I want to know: How many jobs do they create? “Because I'll tell you, and I'm going to turn it over to Senator Ayotte in a second. I'm interested in her perspective as a job creator, as the spouse of a job creator, as someone like me who came off the campaign trail. I traveled the state of Florida for two years campaigning. I have never met a job creator who told me that they were waiting for the next tax increase before they started growing their business. I've never met a single job creator who's ever said to me I can't wait until government raises taxes again so I can go out and create a job. ...“The other great phrase here, you know, both Senator Ayotte and I have only been here a few months so I think we're still learning the language of Washington. I hope it never becomes part of my permanent vocabulary, but one of the things I've been hearing recently is this notion everything should be on the table, which is funny because everything is not on the table, according to the President and others. “For example, there is no serious discussion of a spending cap. I'd love to have a vote -- why don't we have a vote on the balanced budget amendment? Why is that not on the table? Why is a balanced budget amendment not on the table? Why aren’t we voting on that tomorrow? “Because a balanced budget amendment basically says you can't spend money you don't have which makes all the sense in the world to the rest of the people that live in the real world, but apparently that doesn't apply here and the result is these problems we face. “But I actually think some things should be off the table. Let me tell you what should be off the table: bad ideas. If something is a bad idea, it shouldn't be on the table. And I think it is a bad idea to pass things to make it harder to hire people. “How much higher do they want unemployment to be? So here is what I think we have to ask ourselves. These tax increases that Senator Ayotte pointed out along with the regulations kill job creation in America. These tax increases don't do anything about the debt. They don't raise enough money to do anything significant about the debt. They don't create jobs. In fact, they kill them. So how could tax increases that they're outlining be part of a solution? Why is it being offered? “Ultimately these are smart people. They know the math. I think the answer lies in the politics of all of this. The politics of all of this is pretty clear. This appears to be an effort to save face. …“There's got to be spending reductions and it appears to me that the President and others in his party are positioning and are looking for a pound of flesh in return for these cuts so they can go to their political base and say, ‘Look what we’ve got, we got something out of this. We went after the people who made all this money, we went after the greedy millionaires and billionaires. We went after this oil companies, even though this has nothing to do with the debt.’ That’s the only explanation for why this is even on the table. “I think all bad ideas should be off the table. I think anything that kills jobs should be off the table. I think anything that hurts the ability of job creators to grow their business should be off the table. I think anything that helps increase the unemployment rate should be off the table. I think that's what should be off the table. I think anything that hurts our ability to grow our economy should be off the table. And I hope what should be on the table are things that force this government once and for all to put itself back on the path of sanity.